Thunderstorms may have dampened ongoing protests in the St. Louis suburb of Ferguson, Missouri, last night, but other parts of the country – including Philadelphia – saw groups and residents take to the streets to vent their frustration at police misconduct and a lack of officer accountability. Pedestrians stopped to take photos as marchers made their way to the Roundhouse at 8th and Race Streets. A handful of onlookers even joined the procession. Protesters soon gathered at the steps to the front of the Roundhouse – in part because a line of bicycle police had cordoned off 8th Street – but they stayed on that side of headquarters only briefly. One man, who introduced himself as Vision (a local poet and activist), apparently had had enough of allowing the police to determine where the march would go, and so demanded the group move to the 8th Street side to continue airing the anger and frustration evident throughout the evening. At first the only one, the protesters soon followed Vision as police quickly cleared from the street to allow people to follow the man. The emotions intensified at times, as chants continued and some protesters asked pointed questions about racial profiling and police brutality to the line of largely stone-faced officers blocking off the lot that leads to central processing. 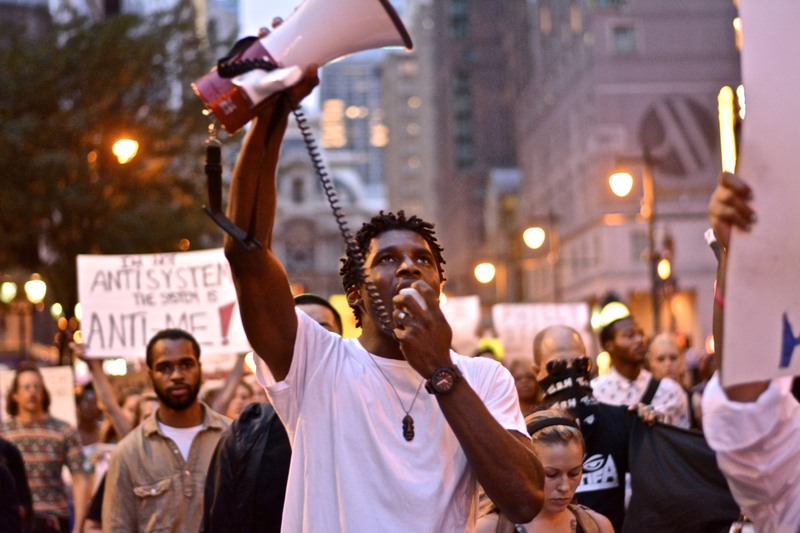 Vision soon took the bullhorn, urging people to join others on Thursday for a bus trip from Philadelphia to Ferguson. He talked to the crowd about how Ferguson needs them and how the community there needs supplies to continue the ongoing protests. I’m sick. I’m sick of the rhetoric. I’m sick of people being afraid…what’s going on in Ferguson needs to be happening in every city, and we’re so afraid and complacent! Whatever happens happens at this point, but I’m not living like this no more.